Some of you might realize that I’m regularly inspired by music….this is an older song, but the video is one I hadn’t seen back at the time Sara came out with it – but it’s inspiring nonetheless. I want to be BRAVE like the folks dancing HERE…thanks to Sara Bareilles for the inspiration! 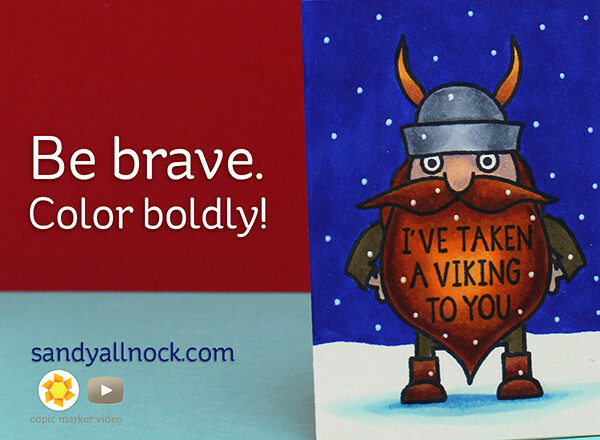 The new little Viking from Avery Elle is another part of the inspiration for this whole “brave coloring” idea – what’s more brave than an explorer! I also wanted to quickly share the Envie die set with you, in case you’re going to be resorting to gift cards this Christmas – lol – my brother in law ONLY wants Starbucks cards every year, so that’s a given, but some other tough-to-shop-for folks may end up with cards too. 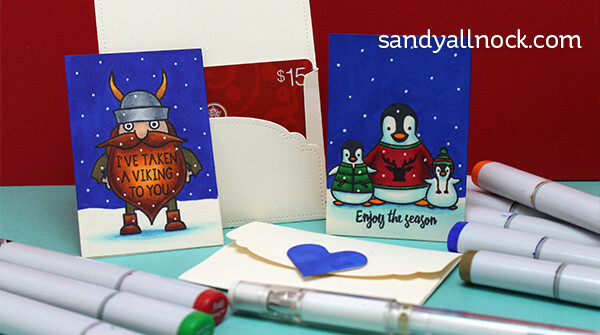 So if you need the die to make your gift cards a bit more special, well…yeah. Join me in that. LOL! I’m just glad it’s a year-round thing because I am so done with buying supplies to get me through the holidays! Without further ado….check out the video below or click HERE to see it in HD on YouTube. Aren’t these just so much fun? Tucking them into stockings, or wrapping them up in a little gift box to tuck under the tree….lots of fun ways to deliver a little card of love. And for Valentine’s Day – yeah baby! Cute small cards the kids can give out at school! 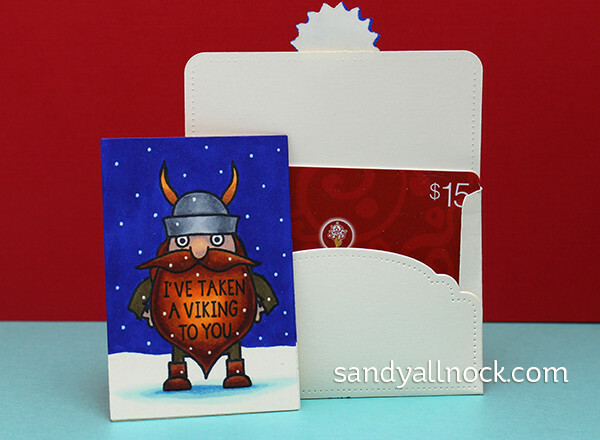 For the Viking piece – which is for my brother in law – I used the simpler end of the envelope as the flap, and attached the starburst “seal” on it – I just colored it with the same blue marker as the background. For both of these I cut another rectangle to put on the back of the colored piece, since marker does go through the cream cardstock. 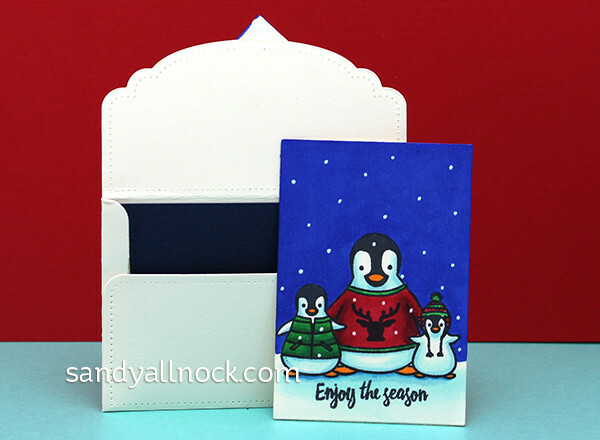 The penguin envelope uses the fancy scalloped side as the enclosure – and for both, I sealed the envelopes with Be Creative tape so the lower flap stays in place. 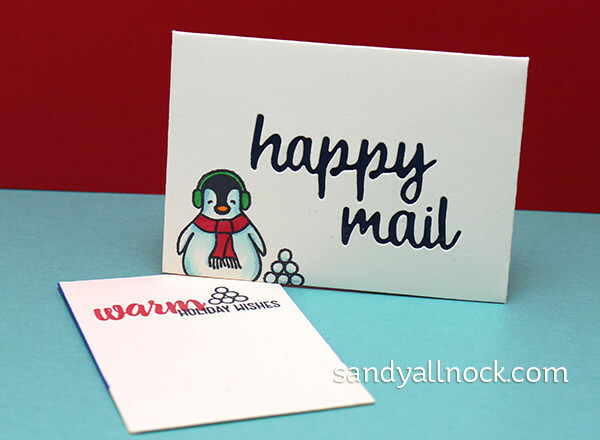 The penguin card has the sentiment diecut from the front of the envelope – and some more fun stamping and coloring with the Penguin Greetings set. Stamp bird image on Bblack cardstock in Versamark and emboss with clear powder. Once it’s cool, apply white pigment ink with a Fantastix or other application tool. Buff with a tissue to “reveal” the embossing – it shows up as a black line. Add more white pigment ink as desired! Don’t forget to decorate the envelope, too. Tie it up with Lawn Fawn Hemp! Copic Sketch Markers: Compared B29 with B28. Wonderful cards. Everyone who gets a card from you should feel special. I know I would. HI SANDY. DID YOU REALISE IT’S SNOWING? THE PENGIES LOOK HAPPY BUT ELRIC LOOKS CROSSER BY THE MINUTE. TAKE CARE. SUE. PS. THE CARDS WERE GREAT. Such an adorable idea — mini cards for quick “pick-me-ups”! Love the cards. Also checked out Sara Bareilles-Brave video and it was great. This has nothing to do with coloring, but I couldn’t help but laugh at the intro ad. to this video. You’ve come a long way in the past year. It used to always be Poise pads we had to watch, but you have moved to the big time now and we get to watch Disney, so congratulations. I’ve been getting bolder with color as of late, but it’s still scary. I may try that bright blue background on something. Thank you for sharing the marker colors-I know that gets tedious for you, but it really helps me learn and make better color choices. My goal isn’t to be you or to exactly replicate what you’ve done. My goal is to be a better me and grow my Copic skills. Your great examples and the color combos really help me, so thank you!